Shell's drill ships are on their way to the Arctic Ocean right now to begin the most aggressive offshore Arctic-drilling program in history, endangering polar bears and their habitat -- unless President Barack Obama decides to stop them in the next few weeks. The clock's ticking, and if we want to get the president's attention -- before it's too late -- we have to get creative. Together with the Sierra Club and other allies, we're holding polar bear uprisings where crowds dressed in white with polar bear masks will dance, in unison, to bring massive public attention to the Arctic's plight. Across the country on Saturday, April 28 we'll set a world record for the most dancing polar bears and, united, we'll save the Arctic. Think of them as flash mobs with a purpose. Join or start a polar bear uprising in your area. It's fun and easy: We'll give you instructions, polar bear masks and all the help you need. 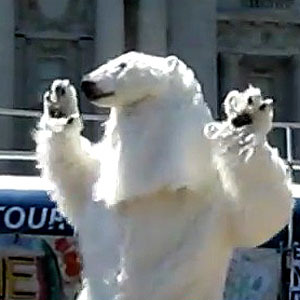 Please join the nationwide movement April 28 and sign up for a polar bear uprising -- and bring all your friends. Also, whether or not you can come to an event, sign our petition to protect the Arctic, then share it on Facebook and join a million voices against Arctic drilling. For more information, please visit our Web page for Arctic oil development.